If you are looking for a reliable, trustworthy Miramar auto repair shop, consider Mode Automotive. Established in 2011, we have been providing our friends and neighbors in the San Diego County area with honest, dependable, and quality auto repair and maintenance services for the past seven years. Our team of experienced, ASE-certified technicians specializes in bumper-to-bumper auto repair for all makes and models of European, Asian, and domestic vehicles. Whether you need a simple job, like an oil change, or a major repair, such as complete engine overhaul, our technicians will inspect your vehicle, diagnose the problem, and apply the required solutions, saving you precious time and money. While our technicians are working on your vehicle, you are more than welcome to spend some time in our clean and comfortable waiting room. There, we have complimentary coffee, cable TV, and free Wi-Fi available to make your time with us even more enjoyable. 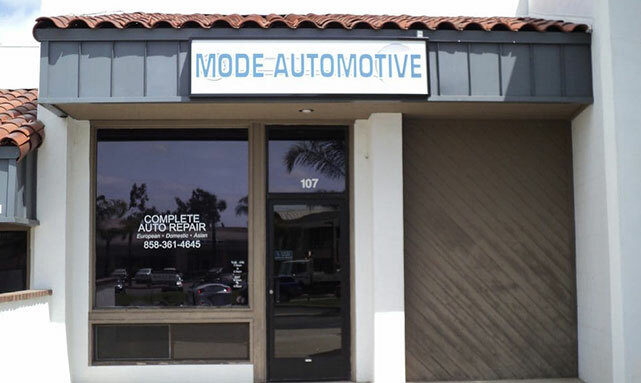 With more than six years of experience performing high-quality auto repair and maintenance services across California, Mode Automotive is a full-service Miramar auto repair facility you can rely on. We provide you with expert customer service and knowledgeable repairs for any vehicle you drive. Give us a call or visit our clean and professional location in Miramar, CA. We’d love to help you! "Amazing service. Ryan is thorough and knows his stuff. After a full diagnostic, he takes the time to explain all that's going on with the car, and makes recommendations accordingly. He's not out to price gouge and drain your wallet. He's out to give great service and help take great care of your car. Highly recommended." "Simply OUTSTANDING!!! This is one of the best places I've ever found for auto services. Ryan is incredibly knowledgeable - far more than the dealerships. He is honest and his charges are very reasonable. No reason to go anywhere else!" 5 star review by J M.